Slideshow presentation is the best way to make boring static pictures fancier to view. 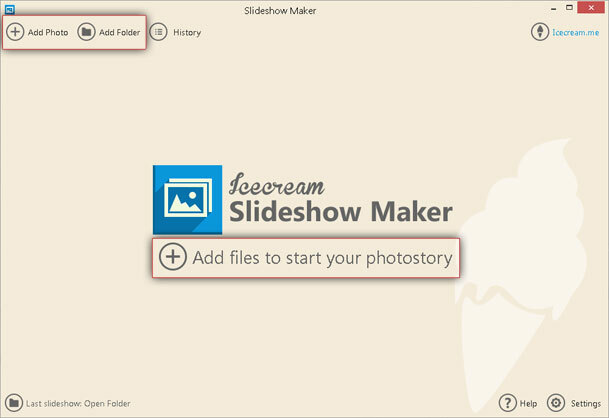 Icecream Slideshow Maker would be your irreplaceable tool when you want to create a basic slideshow in a quick and easy way. This program helps you make an attractive yet not too complicated slideshow presentation in mere minutes. Read the article below to learn more details about how to make a slideshow presentation. If this application hasn’t been installed yet, you have to download Icecream Slideshow Maker from this page – just click the “Download” button and save the installation file on your hard drive. After that, run this file and proceed with the installation as suggested by the Wizard. Usually, it takes about 30 seconds and after that you can open the program and start creating your photostory. Obviously, you are going to use more than one photo for your presentation. There are two ways of importing the images: clicking on the “Add photo” button in the upper left (alternatively, click on the “Add file to start your photostory” button under the program’s logo) or clicking on the “Add folder” button. The last option allows you to import multiple files in a bulk. Note that the program imports all images in the chosen folder, including those stored in the subfolders. If you clicked on the “Add photo” button, you can import single files from different folders. You can press and hold Shift or CTRL buttons to select several files as well. The good news is Icecream Slideshow Maker filters the files and only displays those that are images of suitable formats (JPG, JPEG, PNG, TIFF, BMP). Once your files are added, the main window will be changed and divided into two zones: queue panel at the left and preview window and slideshow settings panel at the right. If you want to move a file's position in the queue, select it and use the arrows on the right to move it up or down. Recycle bin icon at the right side of the file's name allows you to delete it from the list. You can choose time and transition values for each file in the queue by clicking on a corresponding button in front of it. The “Time” setting stands for the time of displaying the image. Clicking on the “Transition” option opens a dropdown menu with a bunch of transition effects. Each of them will be automatically previewed in with a player on the right when you choose it. “Time” and “Transition” values can be different for each file while the rest of the settings will be applied for all the items you queued. You can set the same time and transition values for all your files by selecting them from a gray area under the queue. Besides, you can delete all the files from the queue by clicking on the “Clear list” button. Filename is displayed in a corresponding line on the bottom of the panel. You can manually change the default name (“sshow_yy-mm-dd_hhmmss”) at any time. You can find more settings on the right side of the window right under the preview window. For example, you can select a desired resolution for your project (from 640x480 to 1600x1200) and choose transition duration for the effects. Check the “Scale to fit” box if you want your file to be adjusted to the screen size or the “Original ratio” box to keep an original aspect ratio for each file. The “Add audio” button at the bottom of the panel on the right will help you add an audio file and set it as background music for your presentation. Click on this button and use Windows Explorer to import a music track from your computer. After that, configure the “Offset” setting for your audio file. You can set a positive or negative offset depending on your preferences – the specifics of both are explained in the note that you can view by pointing your cursor over a question mark icon in front of it (such notes are available for all the settings in this panel). Finally, choose the “Fade” value for the audio and skip to making your slideshow presentation. Before you skip to the next step, preview your presentation with a built-in player that you can see on the right side of the window to double check everything looks good and make some changes if necessary. Once you’re all set and ready to start, click on the “Create” button in the bottom right corner of the window. The process will be started immediately and you are allowed to control it with “Pause/Resume” and “Cancel” icons located next to the progress bar on the bottom of the window. When the slideshow presentation is ready, you can check it out in a containing folder that you can access by clicking on the “Open folder” button in a new popup window. 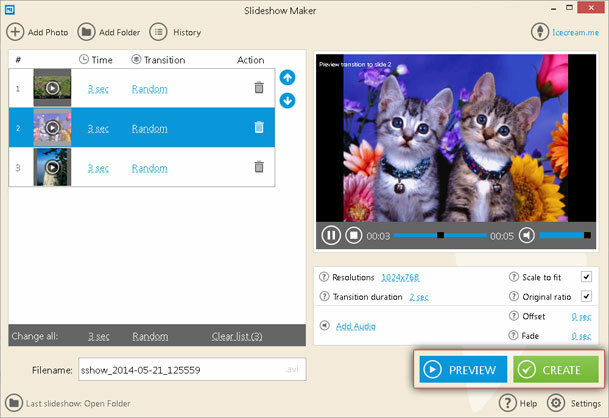 After that, you can quit the application or continue with other slideshow projects.